Here's the selfie it took. The InSight Mars lander really deserved some vacation time. After a strenuous seven months of gliding through outer space, the lander had to survive what NASA described as “seven minutes of terror” — lighting up like a meteorite as it entered the Martian atmosphere at 12,300 mph (19,800 km/h). Now, InSight is basking in the Martian sun. 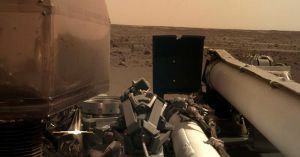 Around 8:30pm EST yesterday, InSight unfurled its solar panels to collect some much needed energy and recharge its batteries, according to an official update from the Jet Propulsion Laboratory (JPL) at NASA. And it will need quite a bit of energy: on a clear day, two 7 feet wide (2.2 meters) solar panels will provide 600 to 700 watts of power — enough electricity to run a household blender — for InSight’s actuators and instruments. What’s next for InSight? First, it sent home a selfie taken with one of its cameras. Next, its robotic arm will extend, and will snap some pictures of the surrounding ground using a camera attached to the end of the arm. The InSight team back on Earth will be looking for suitable ground to deploy InSight’s scientific instruments. But it will still take “two to three months” according to JPL until those instruments are actually ready to send data back to Earth. So for now, InSight, enjoy some sunlight. You’ve earned it.